To improve the health of American Indian/Alaskan Natives in Kansas, Oklahoma and Texas, by providing public health services in epidemiology, data management, data analysis, training, health promotion/disease prevention, and research through outreach and creative partnerships. Promoting healthy communities, serving and strengthening all tribal nations. The Southern Plains Tribal Health Board (SPTHB) is a non-profit organization based in Oklahoma City, Oklahoma. The health board was established in 1972 to provide a unified voice on tribal public health needs and policy for the 44 federally recognized tribes located in the states of Kansas, Oklahoma, and Texas. Board membership includes representatives from the 12 service units in the Indian Health Service (IHS) Oklahoma Area. The SPTHB works closely with federal, state, tribal, and local partners by offering culturally-competent approaches to improve American Indian health outcomes. In 45 years of serving our Tribal Nations, the SPTHB has given over $80 million grant dollars to our tribal communities through community health profiles, emergency management plans, data collection, education, substance abuse and suicide prevention programs, as well as supporting tribal public health initiatives across the United States. The SPTHB serves as a liaison between the Tribal Nations we serve and the National Indian Health Board (NIHB), who works closely with our U.S. Legislators in Washington, D.C., advocating for American Indian health. The Oklahoma Area Tribal Epidemiology Center (OKTEC) is a division under the SPTHB. 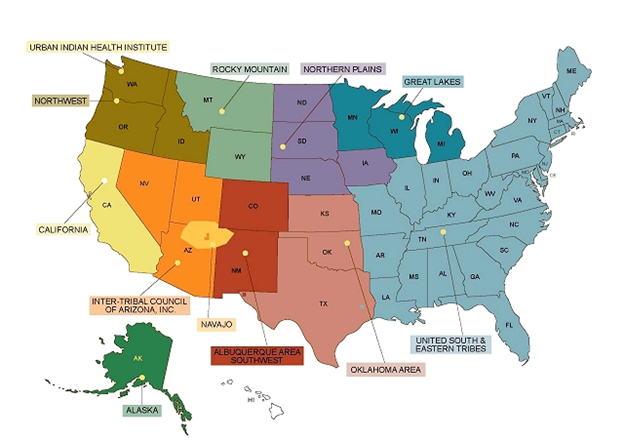 The OKTEC is one of twelve Tribal Epidemiology Centers located across the United States and was established in 2005 through core funding received from the Indian Health Service. The OKTEC coverage area includes Kansas, Oklahoma, and Texas and serves the 44 federally recognized tribes in that area. As a public health program, the OKTEC works with area Tribes, state agencies, tribal organizations, academic institutions, non-profits, and many other agencies to provide a wide range of resources to those we serve. OKTEC stakeholders also make up the Advisory Council, which provide the OKTEC with relevant and timely feedback, recommendations, and program guidance. Many of the services provided by the SPTHB consist of training, technical assistance (TA), education, program evaluation, and internships. The range of services and preventative programs include, but are not limited to, diabetes, heart disease, stroke, cancer, survey design and implementation, program evaluation, tobacco cessation, cultural competency, data analysis, geographic information systems (GIS), and grant writing. The OKTEC also assists AI/AN health systems and programs by improving access to the highest quality AI/AN health data available. A cornerstone to improving public health capacity is ensuring the collection of valid and reliable health related data. Data analysis and effective information dissemination is needed by AI/AN communities and organizations for tribal leadership to have all the facts and tools they need to better advance their community health improvement decisions. The Indian Health Care Improvement Act (IHCIA) was permanently reauthorized in 2010. This reauthorization defined the twelve TECs as “public health authorities” for purposes of the HIPAA Privacy Rule for data sharing. The permanent reauthorization of IHCIA directs the Secretary of the Department of Health and Human Services (DHHS) to grant each TEC access to use of the data, data sets, monitoring systems, delivery systems, and other protected health information (PHI) in the possession of the Secretary. It also requires that the Centers for Disease Control and Prevention (CDC) provide technical assistance, and that CDC work closely with each TEC in strengthening AI/AN disease surveillance. Provide disease surveillance and assist Indian tribes, tribal organizations, and urban Indian communities to promote public health. Effectively executing these seven core functions ensures the OKTEC and the SPTHB stay true to their goal of eliminating health disparities among the AI/AN population in the Southern Plains. The Oklahoma Area Tribal Epidemiology Center operates on funding provided through cooperative agreements with the Indian Health Service (IHS), other federal agencies (such as the CDC, NIH and OMH), state agencies (OSDH, ODMH) and other organizations. The OKTEC is garners most of its funding from federal, state, and foundational grants which requires the OKTEC to constantly explore new funding options and grant programs. The SPTHB and OKTEC held a strategic planning conference in the Fall of 2016 to solicit needs and goals for our AI/AN communities from key stakeholders in our region. This conference yield eight large strategic goals that lay the roadmap for the SPTHB and OKTEC for the next five years. Manage and maintain all SPTHB marketing/branding material and establish the SPTHB brand through the use of the new website, social media, and community engagement. Strengthen the capacity and increase funding to the SPTHB as to better identify and meet the needs of our communities, as well as cultivate SPTHB partnerships. Becomes a central resource hub for American Indian culture, thought education, advocacy, and training. Create and expand new partnerships to increase funding, educate communities in public health and identify gaps and needs for structural/system changes. With our partnerships, development plans, and marketing, create a firm foundation for SPTHB departments and programs to be self-sustaining and financially independent. To improve the work environment for staff through increased trainings, recruitment of specialized employees, expanded infrastructure, and relevant policies. To strengthen partnerships between tribal leaders and federal, state, and local legislatures though advocacy. To increase the effectiveness and efficiency of IT through the creation of policies, partnerships, resources, and targeted personnel. Research involving AI/ANs must incorporate culturally competent methods. Researchers must consider tribal specific traditions, culture, lifestyle, and must consult with tribal leaders when designing a research project involving AI/ANs. Tribal Nations are sovereign and researches must be held accountable to those nations for their research practices. Projects that qualify as research and involves AI/ANs in the Southern Plains (Kansas, Oklahoma, Texas) region must be submitted to the Oklahoma Area Indian Health Services (IHS) Institutional Review Board (IRB) for approval if the Tribe participating in the project does not have their own IRB. However, in some instances both the IHS and Tribal IRB approvals must be obtained. Only after IRB approval and guidelines are obtained can the research project move forward.